So the message here? keep attending regularly, stay fit and healthy, mix your drills and endurance work and you will get faster. At this time of year…..
At the moment I am not working my Triathletes too hard in the water as in the UK/Northern Hemisphere for the most part we are now done with OW racing until next Spring. I am hoping to lure them back after the usual break post Kona and the final overseas races are now done. Once snared I hope to keep them coming back with lots of creative sets. We are in a phase I call Technical Endurance which suits the time of year nicely. We are swimming anywhere from 2000m to 4000m with lots of short technical interruptions to longer steadier swimming. We use swim toys creatively to challenge and interrupt the ‘autopilot’ we often are guilty of cruising along on. Ever got to the end of the pool and asked yourself what was I meant to be working on? Too much cruising pace and it is all too easy to stop thinking about what we are doing or what we are attempting to achieve from a particular set or drill. We perform frequent drills while static at the wall between lengths, off the wall for a few meters (the red ‘zone’ of the lane rope is highly useful) even outside of the water on poolside. Subset – 8 x 25, rest 15s, fast arms with 4 strokes fists clenched into 4 strokes fast arms with normal hands, then easy for the rest of the length. Just looking to get the heart rate up ahead of the main set. Swimming normal FC when the lane rope is Blue and White allows the majority of the length to be swum with a fitness element. The following is a simple way to get a 1500m mainset swum, adding steady fitness but not ignoring technical aspects of your FC. Eventually we all want to perform faster but in terms of swimming at this time I think it is important to learn to swim well again. Especially after a season of OW which can undo a lot of good technique. It is a great time to learn to swim well with good technique again. At this time, I encourage slow swimming for heightened accuracy, improved hand and arm pathways and fixing technical issues that might have arose. In fact, I fail to see how else to go about it. There is little to be gained with hard efforts at the moment. The body needs to recuperate, the mind as well. A fresh approach to swim training will lead to more stimulus to improve. The new fad for giant pull buoys will please many by allowing faster less accurate swimming. I call this lazy swimming. You are covering up a multitude of issues in your FC technique that might be uncovered come race day if the temperature goes up and it’s a no wetsuit kind of day. Repeatedly I get asked by Triathletes if they can join my fast Wednesday AM group, one of my stronger sessions that has created multiple Kona qualifiers. The lure of rubbing shoulders with several Kona Qualifiers must be the attraction? For anyone still finding swimming 400m non-stop at any pace tiring then a hard fitness session is not really in your best interest. Technique will be of far more use for the moment. Slow is good, slow is accurate, slow is ingraining new good habits, slow is erasing bad habits, slow is what happens before you start swimming fast closer to race season. Don’t be in a hurry to leave this period of your swim journey too soon. The ads promise great returns in speed with the latest piece of equipment or style of session but it’s a good place to be for a while, erasing bad habits permanently, making use of ‘active recovery’ and learning good movements permanently. To make things permanent is going to take some time and also some frequency. Have you ever noticed at the pool the fastest kickers tend to also be the fastest swimmers? not an exact science but next time if/when you are at the pool have a look at the people in the faster lanes. For us who coach, with multiple lanes to observe ie our London Bridge session it is clear that the faster kickers for the most part are also in the faster two lanes <lanes 3&4, 4 being top lane>. So we know a bad kick is devastating in terms of incorrect propulsion <downwards> and higher energy costs. We know mechanically the legs do so much damage. Toes pointing down, excessive two way pivot at the knee, pedalling through the water all undo the work of the arms as they try to pull you forwards. Correct this and swimming will become a whole lot easier. But what about the difference between lanes 3&4 <Lanes where the swim speeds are closer? ie at London Bridge where we have 4 lanes and can spot trends a little easier> What is it about the better kick of lane 4 <mechanics, efficiency, speed and propulsion> that adds speed? Don’t panic this is not for everyone and we are not trying to exhaust your legs for the bike. Train the legs within the stroke, get fitter, and so faster. Bike will not be impacted. Coach Gary Hall who I have a lot of time for suggests “ Improving your freestyle kicking technique will virtually guarantee that you will swim freestyle faster and there is no better way to accomplish this than to incorporate creative freestyle kicking sets into your swim training program. The speed of the freestyle kick is the baseline speed for your freestyle. 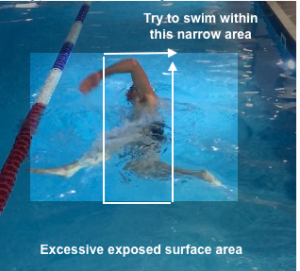 The higher the baseline speed (kick speed), the faster you will swim, after adding your pulling motion and body rotation. First we unlearn this ! if you do suffer from this kind of kick please email me as I have a fins based solution to help remedy this big problem within swimming. Progress to the narrow, hidden, fast big toes brushing, small hip range <think pendulum, a tiny movement at the hip is sufficient to keep it small at the feet> straight on the upsweep movement, bend on the down beat…have a think about the mechanics of your kick this week. Hands on Glutes to think about the correct muscles lifting a straight leg back up to the surface.